Uganda is a landlocked country in East Africa and lies on the equator. The country consists for the most part of a savanna-covered, dry plateau. Lake Victoria lies in the southeastern corner of the nation. 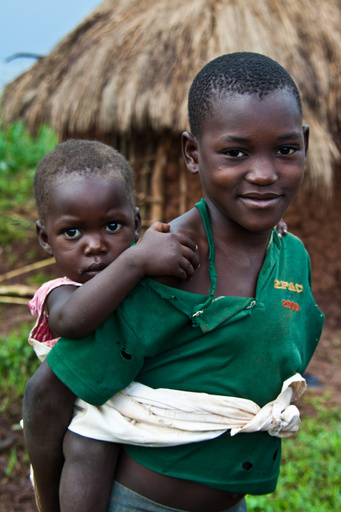 There are not enough health centers and hospitals in the rural regions of Uganda, which is why medical care is only available to around half the inhabitants. This poses a serious risk to the health of pregnant women, children and mothers. In most cases, this is attributable to a shortage of suitable equipment and qualified medical personnel. The aim of the project was therefore to build and equip a labor and delivery unit with a capacity to treat around 200 pregnant women and their children every year. In addition, medical care for mothers and children was to be improved, and maternal and infant mortality rates reduced. A building containing seven rooms, including a delivery room, a reception and a room for premature babies has been built. A water tank has also been installed to provide the labor and delivery unit with a sufficient supply of clean water. The community was committed to the project right from the start. The site, for example, was provided by the local municipality and the inhabitants participated in the building work. The project ran from May 2009 to June 2010. It was possible to finance the whole building project with a donation of around 40.000,00 Euro from Arthrex. The 3,728 people in the community of Namuningi benefited from the health center. Pregnant women and their children can now receive adequate medical care and avoid HIV infection when giving birth. In addition, the government of the Kamuli district has announced that it will continue to support the labor and delivery unit, employ qualified health care personnel and take care of medical supplies.